Lyrica Blankfein was born in Pacific Palisades, California and began her ballet training at the age of 5 at Westside Academy of Dance, under the guidance of Yvonne Mounsey, former principal dancer for George Balanchine’s New York City Ballet, and Francine Kessler Lavac. A short clip with Lyrica in rehearsal for WSB’s 2014 Spring Fling can be viewed here. 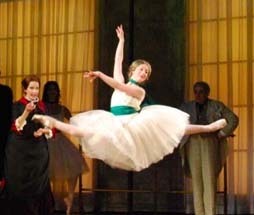 While training for the ballet, Lyrica began her professional career as an actress as well. She appeared in numerous commercials and also had a recurring role for two years on Boston Public. Additionally, she guest starred on Private Practice, and Bunheads. During this time she began her Vaganova training with Valeria Gorchekova. Lyrica has worked with Tony Award Winning director/choreographer Susan Stroman, on a new ballet musical based on Edgar Degas’ famous statue, Little Dancer Aged 14 of the Paris Opera Ballet. Lyrica recently completed a 6 week pre-Broadway run of Little Dancer at the Kennedy Center in Washington, D.C. where she performed the role of “Chantal Brett” and understudied the leading role of “Young Marie” for Tiler Peck. In 2019, continuing her Broadway career, she has gone on from Anastasia, the Musical, to Marie, Dancing Still (formerly known as Little Dancer), starring with Tiler Peck.